Spring has sprung here in the U.S. The days are warm, sunny and gorgeous with lovely blooms and blossoms springing up here, there and everywhere. One of the quintessential signs of spring at it’s peak, in our southeastern corner of the country, is the short, but gloriously sweet season of local strawberries. One bite of a bright red, juicy strawberry – farm-picked just hours before, makes you realize that the store-bought variety you’ve been eating for the past few months ………. well, perhaps they weren’t really strawberries after all. That’s when I start thinking about Strawberry Freezer Jam. One of the quintessential signs of spring at it’s peak, in our southeastern corner of the country, is the short, but gloriously sweet season of local strawberries. One bite of a bright red, juicy strawberry – farm-picked just hours before, makes you realize that the store-bought variety you’ve been eating for the past few months ………. well, perhaps they weren’t really strawberries after all. I love to capture this delightful essence of spring in glass jars stored in my freezer. On short, dark and dreary winter days, all I have to do is pull out a jar of this scarlet sunshine and I am instantly transported to brighter days. Because freezer jam isn’t simmered on the stovetop, it explodes with fresh vibrant flavor and color, unlike the traditional, cooked variety. There is one drawback to freezer jam; sometimes, because it’s not cooked, it can tend to be a bit grainy. Over the years, I’ve developed a few simple steps to overcome this problem; a bit of extra stirring and a two minute stint in the microwave helps dissolve the sugar without dulling the flavor and color. 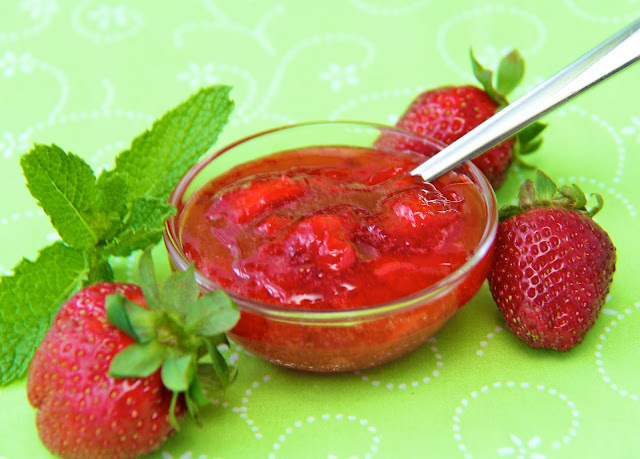 If you’ve never made freezer jam you REALY need to try this – I promise you won’t be disappointed! The most delicious, fresh tasting jam. Once you try it, you'll be spoiled for life. I call it "springtime in a jar". 1 pouch liquid fruit pectin I use Certo which is readily available at most supermarkets. At times it can be hard to find. I usually just ask at the front desk since every store seems to keep it in a different area. Wash and rinse glass* or plastic containers and lids in the dishwasher or with hot soapy water. Dry thoroughly. Measure exactly* 4 cups of sugar into a medium size bowl. Stem and crush strawberries. Don't try to use a blender or food processor for this step as you want some small pieces of strawberry to remain (I like to use a potato masher). Measure exactly** 2 cups prepared fruit into large microwave-safe bowl. Stir in sugar. Let stand 20 min., stirring occasionally. After the 20 minutes, stir mixture for 1 minute then place in microwave on high for 2 minutes. Mixture will not cook but will become warm enough for sugar to dissolve. Remove from microwave and stir continuously for 2 minutes. Combine liquid pectin and lemon juice in a small bowl. Add to strawberry mixture; stir 3 minutes. Take a taste to make sure the sugar is dissolved. If it still tastes a bit grainy stir for another minute or two until almost all sugar is dissolved. Fill containers immediately (you don't want jam to start to "set" before you get it into the jars) to within 1/2 inch of top- don't fill any higher as mixture will expand a bit in the freezer. * ~Don't worry about putting glass jars in the freezer. I've done if for at least a hundred years now, and never have had a problem. 🙂 Just make sure to leave a half inch of room at the top to allow for expanding in the freezer. Making jam is a very exact science. Often when I cook, I add a "bit" of this or a "dash" of that - but not when making jam. 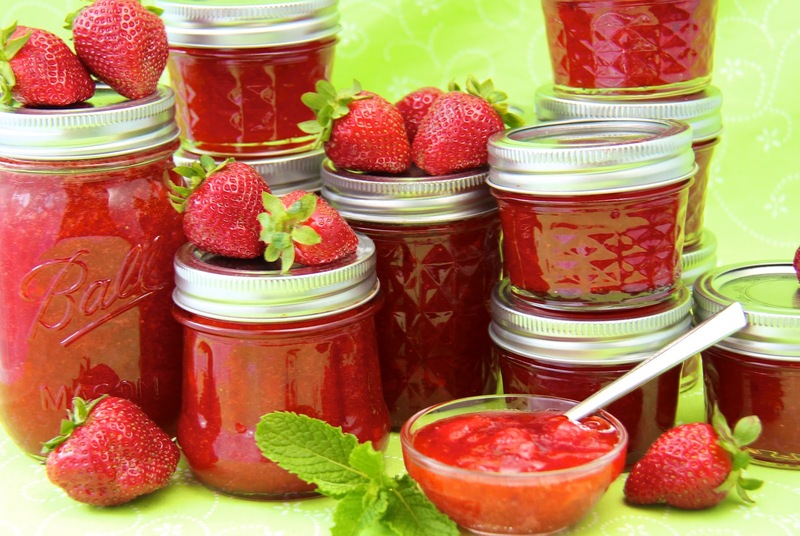 If the proportions of fruit and sugar are not correct, the jam will not set properly. I learned this many years ago the hard way; instead of jam, I ended up with a soupy sauce that was only suitable for topping ice cream. Be sure to use an accurate measuring cup, spoon ingredients into cup, then level off with a straight-edged table knife. Grab a magazine and set a timer for the stirring steps. Thorough stirring is essential when making freezer jam to ensure a smooth, ungrainy finished product. I like to use a plastic spatula and frequently scrape the sides of the bowl during the stirring process. I love your site! I’ve just found it about a week ago and have been obsessed ever since! Could I use frozen Strawberries for this recipe? Thanks so much, Debb. Welcome to The Café! Yes, you could definitely use frozen berries. In fact, frozen are really better when local berries are not in season. Jam looks lovely! I have just started making freezer jam and some of it was grainy. Do you microwave it after adding the liquid pectin or before? Had good luck with raspberry (my fave) but not with blackberry jam. Looking forward to making strawberry next season. Thanks! Microwave it before the liquid pectin to allow the sugar to dissolve. Thanks for your question Sheryl! 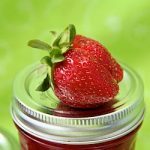 what happens if you microwave after the pectin is added? thank you. I have a feeling the recipe would not be successful Elizabeth. I’d use the microwave before adding the pectin. Just made a batch and it looks delightful! I tasted it just prior to putting it in the jars and it was smooth and delicious. It smells and looks great too! Thanks for the detailed recipe and method. I am brand new at this and the detailed description of what to do – peppered with tips and things to NOT worry about – is reassuring! Thanks Jackie … and welcome! 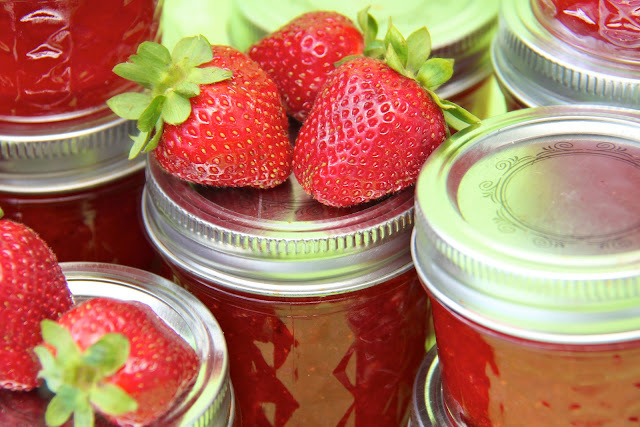 Yes, freezer jam is a “win-win” – so flavorful and yet, so easy to make! Check a little deeper here at TCSF and you’ll see even more delightful combinations! I’ve read your microwave directions too late! I have already made the standard recipe freezer strawberry jam recipe and now that it’s frozen I tasted it and discovered sugar granules – yuck! I’m so sorry that happened. I’m honestly not sure if it can be corrected at this point. thank you SO much!!! the last few times I tried to make home made freezer strawberry jam the SUGAR NEVER DISSOLVED! I tried this and you saved my frustration!!!! Microwaving it as you suggest is fantastic. Your measurements are bang on and i now made 2.5 batches using your directions. I am SO THANKFUL! Cheers. Thanks so much for taking the time to leave a comment. So happy this worked for you. I was always frustrated with freezer jam because it was often grainy though I loved the fresh flavor. So I was super excited when I figured out this simple microwave trick and I love sharing it with others. Especially when they get as enthused as I do about stuff like this! Great recipe for freezer jam. I am actually going to the farm stand today to get some raw milk. I will definitely pick up some berries. You’ve inspired me. I may have solved the issue of sugar grains in the jam. The last 2 batches I put in the freezer without letting them sit for overnight. The jars maybe sat for 6 hrs max. because the jam was well set. The recipe says 24 hrs. or until set. Yesterday’s batch sat overnight for approx. 17 hrs. There was no grainy texture this morning. Great tip to avoid the graininess. Thanks Chris. Look fantastic I love strawberries! !